Browsing through the list of shows for this year’s PuSh Festival, I stumbled across a performance called Do You See What I Mean? 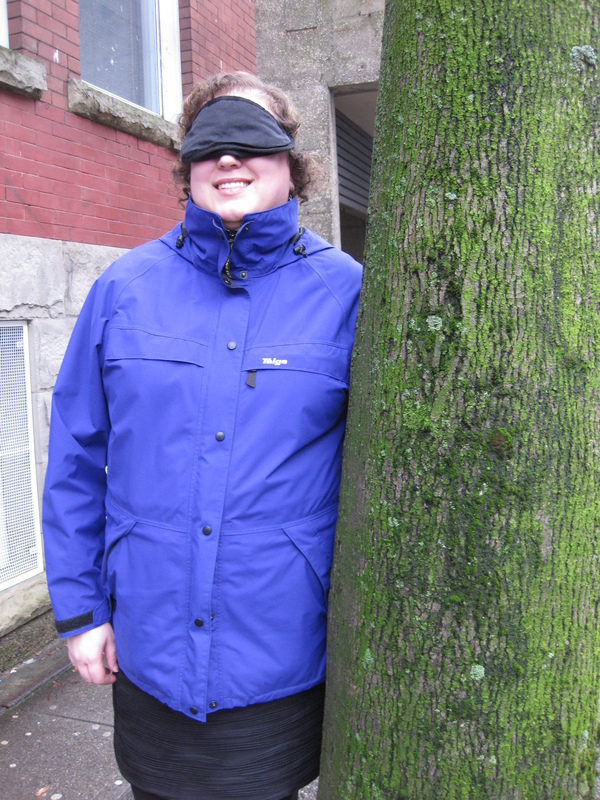 Described as a “captivating piece of one-on-one theatre” that involves a 2.5 hour blindfolded tour of Vancouver, I was immediately intrigued. It sounded so bizarre, so unusual, so interesting that I felt compelled to do it. So—with a mixture of excitement and fear—I went ahead and booked my tour for the coming Saturday, not quite sure what to expect. The tour started at the Access Gallery in Chinatown. I was greeted by PuSh organizer Peter and waited in a plain white room, gazing at two lonely pieces of art, one on each side of the room. When my turn came, I was greeted by Martial Chazallon, one of the Lyon-based choreographers that created the show. He put my blindfold on, explained the basic guiding technique and then led me into another room where I met my guide Devon. And then we were off. My guide Devon and I clicked right away—we had a similar sense of humour along with a similar sarcastic streak. In the first block I joked that a friend told me to make sure I was with someone from the PuSh Festival and Devon quickly replied, “Oh, is this supposed to be something with the PuSh Festival?” Cheeky. But I’ve been called a cheeky monkey on more than one occasion, so it suited me just fine. My experience during those first few steps was what you might expect—I felt like I was in a dream: a bit disoriented, clouded in darkness, imagination churning but unable to see what’s real. And the sounds—oh, the sounds! Everything was so loud. As we approached a busy street, the traffic seemed frighteningly close and imposing. I heard a large truck roar to a start and felt its intrusive sound waves deep in my chest. I knew the next 2.5 hours were going to be one heck of a ride. Others were less obvious: a lounge-type place with lots of cozy seating, a TV and pool table (where I was temporarily guided by someone who is visually impaired); a large, peaceful space full of movement. 1. I felt safer and less vulnerable than I expected to. I imagined I would be shuffling around at a snail’s pace, taking timid steps and feeling a bit uncomfortable. But that wasn’t the case at all. It didn’t take long before we were motoring around at a pretty fast pace—going here and there, up and down stairs, navigating small spaces, riding an elevator, sitting down for tea. For me, it came down to trust. I had a guide there to help me and I just had to trust that he was going to look after me (and he did—thanks, Devon!). 2. I felt more confident than self-conscious. I wouldn’t say that I’m an extremely self-conscious person, but I have my moments (don’t we all?). So I found it interested that while blindfolded, I felt a complete lack of self-consciousness. Looking back I’m sure I looked quite silly at many points during the tour, but I didn’t really think about it. I didn’t know who was watching or how they were responding, so it didn’t even enter my thought process. I could only deal with the sensory information I could access—the ground beneath my feet, my guide’s elbow, the sounds, the smells. It felt like a completely judgment-free space. This led me to realize that feeling self-conscious is primarily fed by visual cues, whether real or perceived. For example, I may see someone frowning and wonder: Why are they frowning? Are they frowning at me? Did I so something to annoy them? But I couldn’t see any of those types of cues. With no reflection of how the world around me was responding, I didn’t have anything to feel self-conscious about. Out of curiosity, I did ask Devon about how passersby responded to us in general—he said most didn’t notice or pretended not to. 3. What I imagined was way more interesting than reality. Without any visual information, there are a lot of gaps to fill in. I realized afterwards that during the tour my imagination was on overdrive trying to interpret who, what, where and why. And now that I know some of the places I went, I realize that what I imagined was WAY more interesting and exciting than the reality. 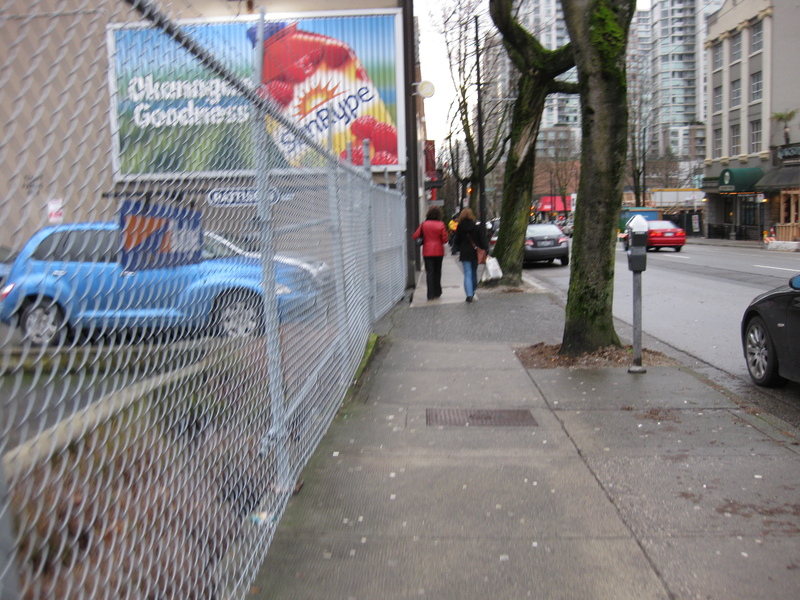 For example, I blindly took these two photos during the tour with my point-and-shoot camera. 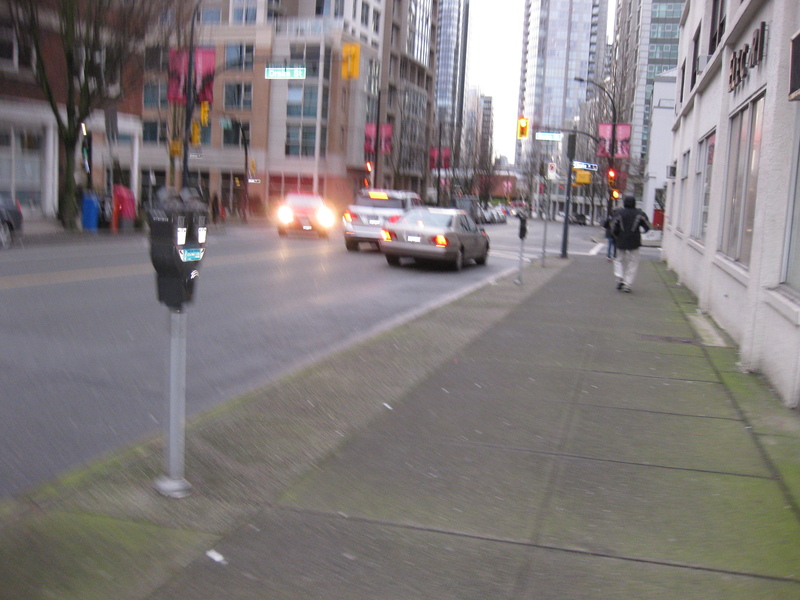 When I looked at the photos afterwards, I realized I was just on some boring old streets in Vancouver. But at the time I felt like I was on a big adventure where everything was so new and cool and mysterious! My imagination really ran wild during one of the final activities. What I imagined and the reality I discovered later were worlds apart. My guide led me inside a building where I immediately felt a sense of warmth, quiet and calm. It made me think of a church. I was then guided to a chair and asked to take off my shoes, socks and coat. Taking off your shoes and socks is sometimes done out of respect in a sacred space, so this supported my original thought that I may be in some kind of church or temple. A man sat beside me and said in a near whisper that he would be guiding me for a bit. I grasped his left elbow and we were off. We walked around in what felt like different patterns—our movements felt very deliberate and symmetrical. There was no talking. I kept thinking it was some sort of ritual. It actually made me think of the labyrinth at St. Paul’s Anglican Church in the West End, which is generally used for walking meditation. We were walking, then shuffling back and forth, bowing to the ground, sitting on the ground, running around in a circle. The bowing in particular made me feel like we were doing some sort of prayer. I imagined simple and stunning decor around us, my guide wearing a beautiful outfit and incense burning in a back room. At first I was just being dragged along by my guide, trying to keep up with him. Then I found the speed and rhythm. At one point I thought to myself, “Am I dancing? Maybe I should try to look a bit more graceful.” It’s interesting that through the sounds and one connection point at his elbow, I could generally sense a lot of his movements. At one point, he bowed down and then there was a stillness—ah, he was sitting down I realized. Some slight stirring indicated that it was time to stand up. I realized how much I could sense. After some fast-paced movements, we stilled—and there was an incredible quiet moment where our breathing was in perfect unison and the rise and fall of our chests kept time. It was an amazing feeling of connection. The movements stopped and the tour ended shortly after. I found out that I wasn’t in a church or temple or other sacred space—I was at the Roundhouse in Yaletown. It was a large, empty room and I had been led around by a dancer (Martin Blank, the other Lyon-based choreographer that created the show), who was dressed plainly and led me through what was likely a very random sequence of movements. Seeing the stark contrast between what I had imagined and the reality that stood before me, I had to laugh. I liked my version better. But the cool thing is—now I get to have both versions. At the end of the tour, there was one final decision I had to make—did I want to see my guide Devon? I really struggled with the decision. At the beginning of the tour, I would have immediately said yes. But after this crazy experience, I wondered if I should keep the mystery going and leave it unknown. In the end, I decided to see my guide. There were so many mysteries and unknowns during the tour, I felt like I wanted to have at least one real, personal connection to the experience. And I’m glad I did. We had a great chat and I made a new friend. The Do You See What I Mean? blind tour was an incredible experience. It’s a reminder to me that stepping out of my comfort zone can be awesomely rewarding. Thank you to all the organizers and volunteers who helped bring the show to life. I can now say—yes, I see what you mean. This entry was posted in Arts & Culture and tagged PuSH Festival, Vancouver by Jane. Bookmark the permalink. As a woman with eye disease and the very real possibility of going blind, I thank you. This has just twisted my fear into a beautiful song of hope. Yes, Thank you. What a fantastic perspective! You’ve really captured the sensual components that emerge when one sense is removed. I could almost feel like I was there too. And what a great idea to write about your experience. This is great Jane, I got such a hopeful message from this, everything we need is inside us. Well done!